Mrs May’s allies were last week said to be plotting to hold a new election in a desperate bid to break the Brexit deadlock. But former Tory leader Lord Hague said such a move would be “nonsensical” because the party is so divided over Brexit. In a damning attack, the peer said any Downing Street aides actively considering the idea were either drunk or ill. He warned a new poll could open the door for hard-left Labour leader Jeremy Corbyn to become Prime Minister. He said: “If you find yourself talking, as some Tory aides were reported at the weekend as doing, of deliberately having another general election soon, you have probably had too much alcohol, or you might even need medical help. “If the party were united on Brexit, it would be a brave idea. As things stand, it is a nonsensical one. 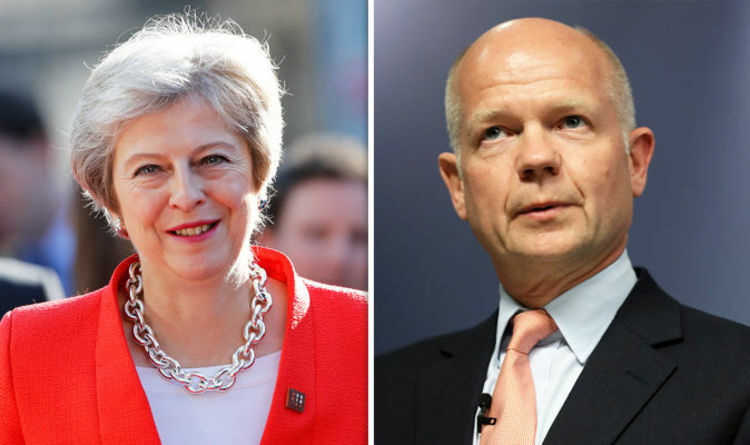 Lord Hague also urged Tory MPs not to trigger a vote of no-confidence in Theresa May despite growing anger at her plans for Brexit. He said: “It is clear that the next two months will be of vast importance in deciding many aspects of this country’s future. The former Foreign Secretary went on to lash out at Labour’s “bullying, poisonous atmosphere” under Mr Corbyn’s leadership. Brexit Secretary Dominic Raab dismissed claims on Sunday that Mrs May was gearing up for another snap election. Labour’s Shadow Chancellor John Donnell yesterday urged Mrs May to call a general election, saying his party was “ready” for a fresh poll.